The 14th annual Bud Harbin Battle by the Beach wrestling tournament faced off the 2014-15 high school wrestling season for four Grossmont Conference teams Dec. 6 at Mar Vista High School in Imperial Beach. The Grossmont Foothillers led the East County contingent with a second-place team finish in the 19-team field. The Foothillers had five wrestlers who finished third or higher in the tournament, including four finalists, and had seven wrestlers who placed fifth or higher. 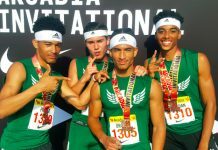 Grossmont head coach Todd Bell said his team is hoping to score a top-end finish in the race for this year’s Grossmont Hills League dual meet title. The Imperial Tigers captured the Battle by the Beach team title with 155 points, followed by the runner-up Foothillers with 125 points. 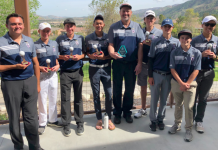 The Monte Vista Monarchs finished fifth in the field, followed by the Granite Hills Eagles (seventh place) and Steele Canyon Cougars (ninth place). Monte Vista finished with 107 points—just two points behind fourth place Mission Hills and four points behind third place Mira Mesa (defending Division I team champions). Granite Hills finished with 103 points—just a half-point behind the sixth-place Chula Vista Spartans and four points behind Monte Vista. Steele Canyon finished with 84 points—just one point behind seventh place (and tournament host) Mar Vista. Overall, it was a promising debut for East County man men, with 10 advancing to championship-round matches and five taking home gold medals. Individual weight class champions included Monte Vista’s Giovanni Pagan (106 pounds), Grossmont’s Jorge Ramos (113 pounds) and Christian Mora (160 pounds), Steele Canyon’s Johnathan (J.R.) Fischer (220 pounds) and Granite Hills’ Victor Garcia (285 pounds). Second-place medalists included Steele Canyon’s Anthony Lopez (106), Monte Vista’s Mario Hernandez (126), Grossmont’s Jason Tiensvold (170), Steele Canyon’s Colin Forman (195) and Grossmont’s Marcus Morgan (285). Among the parade of champions, Pagan (3:22) and Fischer (2:27) both won their finals matches by pins. Individual awards were also presented to third-, fourth- and fifth-place finishers. Third-place medalists included Monte Vista’s Andres Lopez (120), Grossmont’s Bryce Harmon (182) and Granite Hills’ Westley Bass (195). Harmon finished the tournament with four pins. Fourth-place medalists included Steele Canyon’s Darian Murphy (113), Monte Vista’s Jesus Caleron (138) and Granite Hills’ Jake English (182). Fifth-place medalists included Grossmont’s Ibra Wane (120), Granite Hills’ Alex Love (152), and Grossmont’s Jamie Slater (182). Sixth-place finishers included Granite Hills’ Nathan Ballow (126), Monte Vista’s Ray Davis (132), Granite Hills’ Mason Andrews (138) and Monte Vista’s Anthony Rojas (195) and Alan Elia (285). Steele Canyon coach Dan Kida admits his team is on the young side this season, though he expects his squad to earn its share of respect on the mat.